PI115. 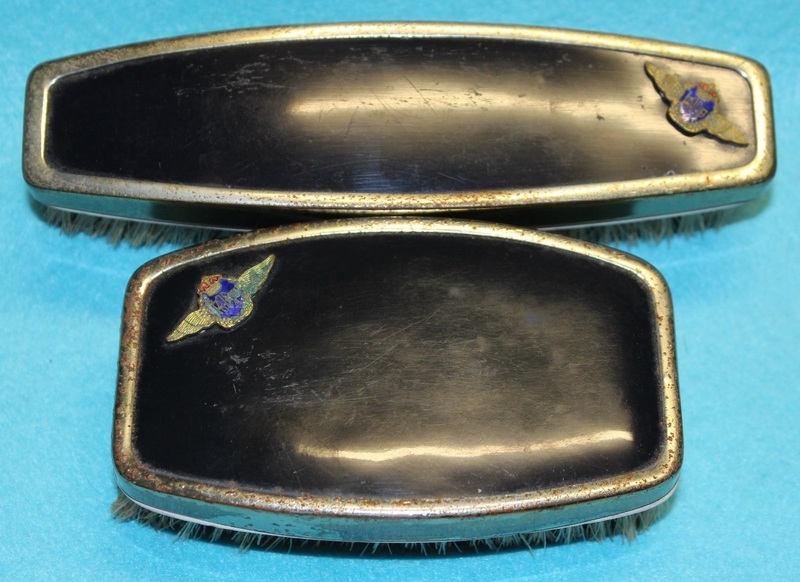 A pair of black and gold clothes brushes with gilt pilots badges. PI123. 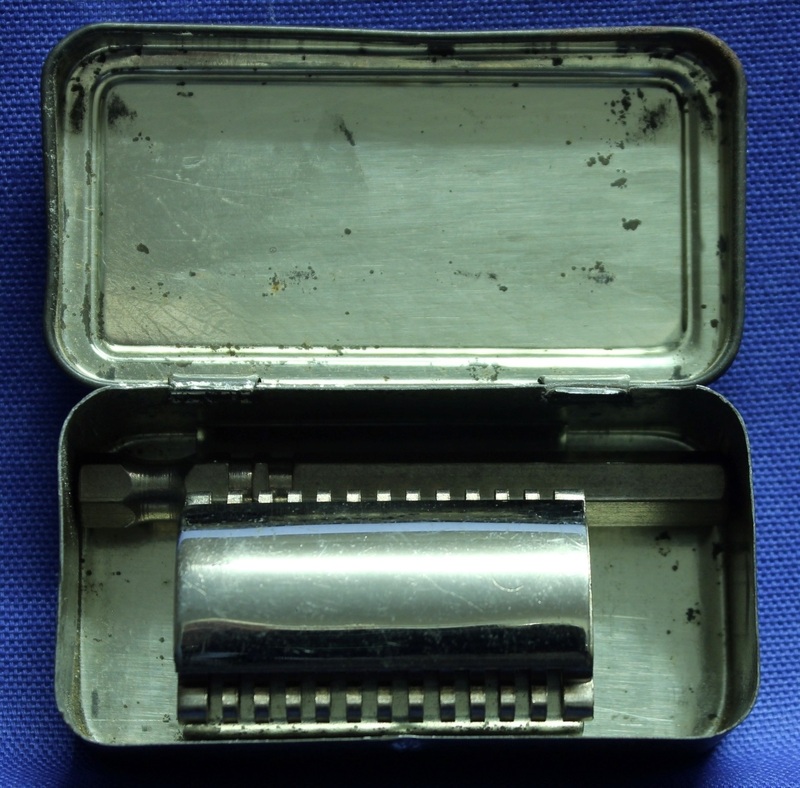 A small tin with 81366 COMPTON NT? 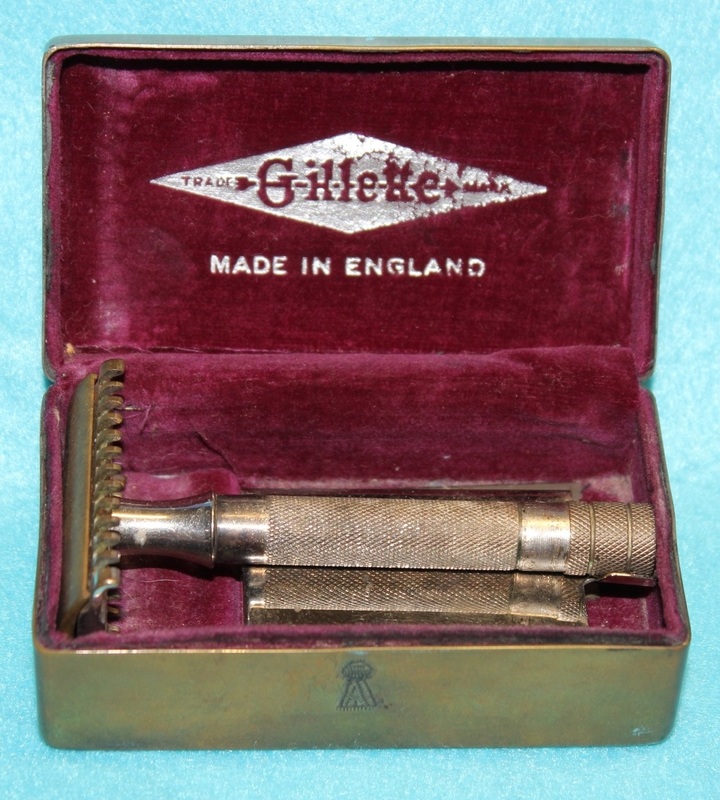 Scratched into the lid, inside is a Gillette razor. John Norman Compton enlisted on 20 Jul 1942 at Perth and discharged on 6 Mar 1946 as a Leading Aircraftman from 2 T & M O.
PI137. 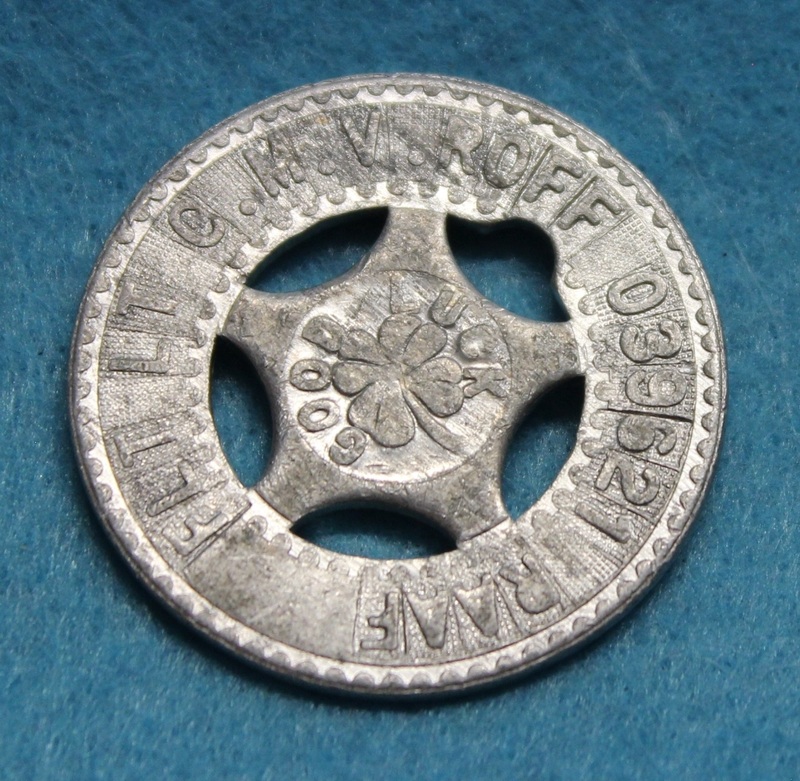 A silver token with a US flag on one side and a 4 leaf clover and good luck on the other. Named to Flt Lt C. M. V. Roff 039621 RAAF. PI141. 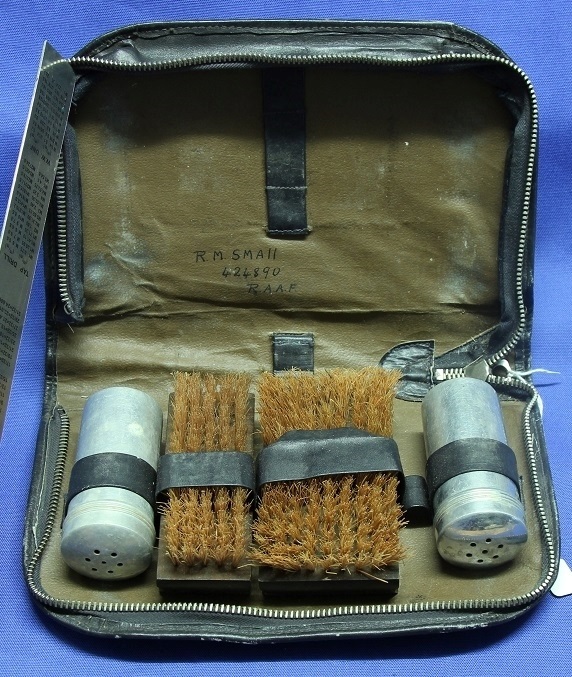 A brown leather pouch containing 2 aluminium powder containers and 2 clothes brushes. 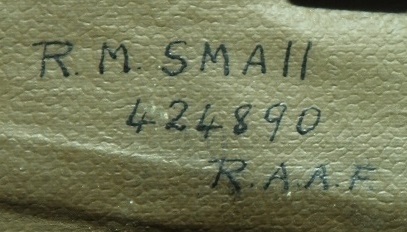 Named to R. M. Small 424890 RAAF. Reginald Murray Small enlisted on 9 Oct 1942 at Sydney and discharged on 18 Jan 1946 as a Warrant Officer from 14 Aircrew Holding Unit. PI141. Name and service number inside. PI142. 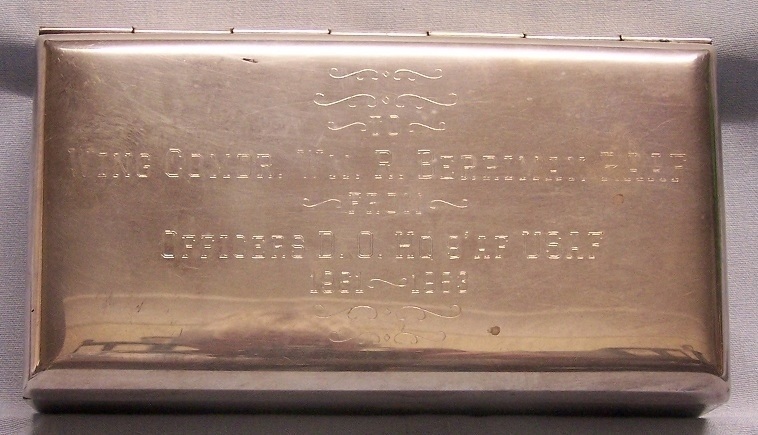 A cream coloured tin for personnel effects named to 60484 McDougall. Raymond Charles McDougall enlisted on 19 Aug 1941 at Sydney and discharged on 8 Apr 1946 as a Sergeant from 2 Recruit Depot. PI151. 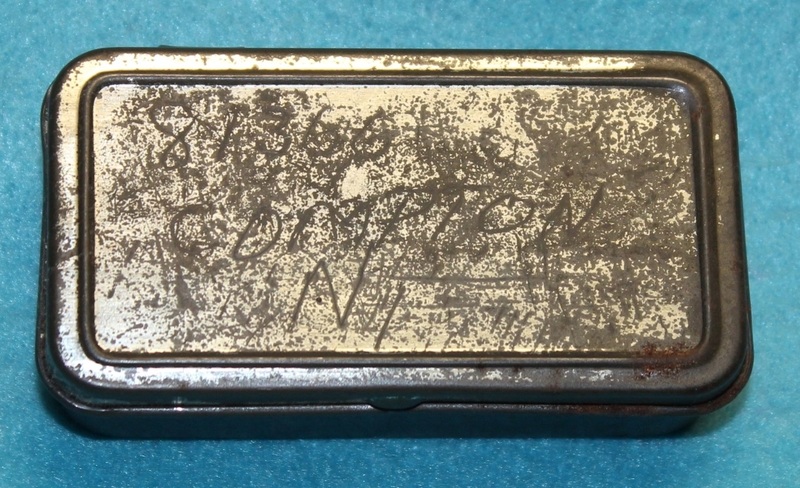 A tan flight bag named to 425344 Mitchell H. L. Hugh Lyle Mitchell enlisted on 1 Feb 1942 at Brisbane and discharged on 24 May 1946 as a Flying Officer from RCOR SECT RAF REC SECT. PI152. 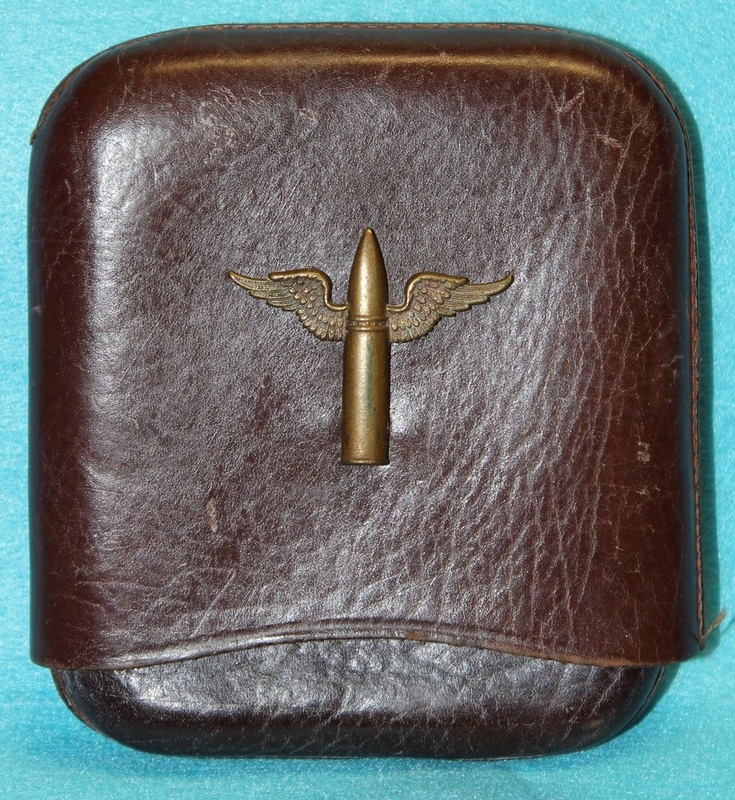 A brown leather tobacco or cigarette holder with an early type brass Air Gunners sleeve badge. PI155. 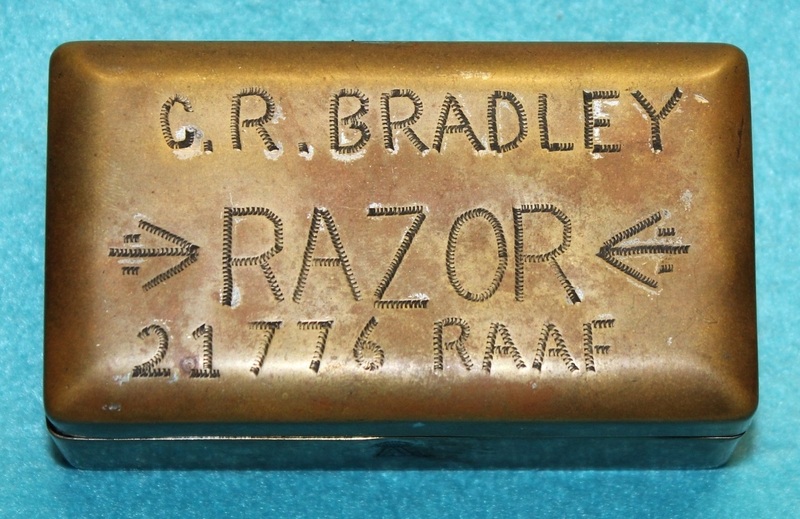 A small brass tin stamped C. R. Bradley RAZOR 21776 RAAF containing a Gillette razor. Cecil Reginald Bradley enlisted on 13 Feb 1941 and discharged on 21 Aug 1944 as a Leading Aircraftman from RAAF Station Canberra. PI187. 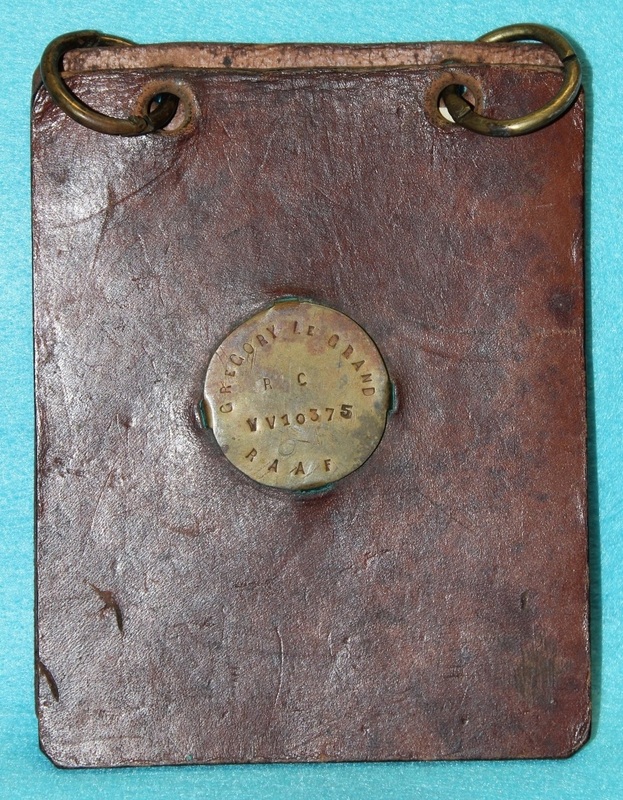 A brown leather notebook cover with a metal disc stamped Gregory Le Grand R C VV10375 RAAF. 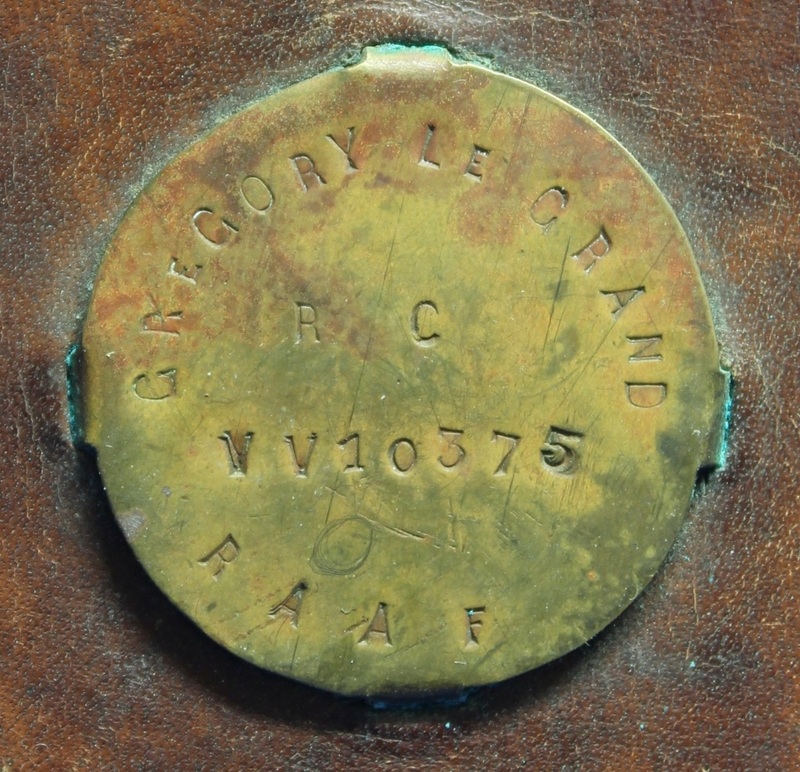 Gregory Le Grand enlisted on 23 May 1940 at Melbourne and discharged on 19 Sep 1945 as a Sergeant from 1 Communications Unit. PI187. Close up of disc on cover. PI188. 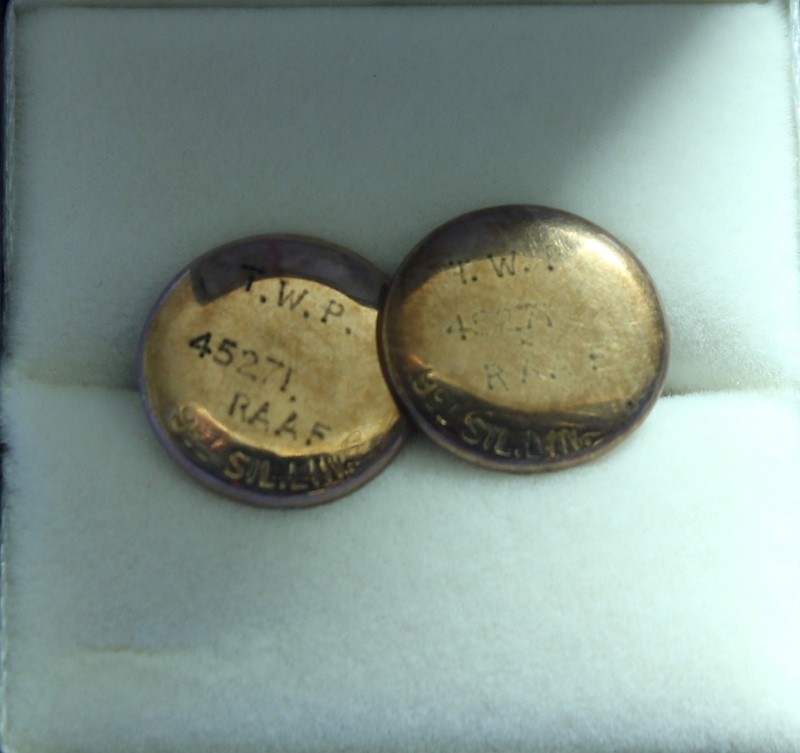 A Pair of 9ct collar studs engraved T. W. P. 45271 RAAF. Thomas William Puddey enlisted on 16 Jul 1941 at Perth and discharged on 28 Nov 1945 as a Leading Aircraftman from 2 Flying Boat Maintenance Unit. PI193. 2 wooden clothes/shoe brushes stamped 1498 RAAF. Kelvin Henderson-Wilson enlisted on 17 Jan 1938 at Laverton and discharged on 17 Apr 1947 as a Flight Lieutenant from Laverton. PI194. 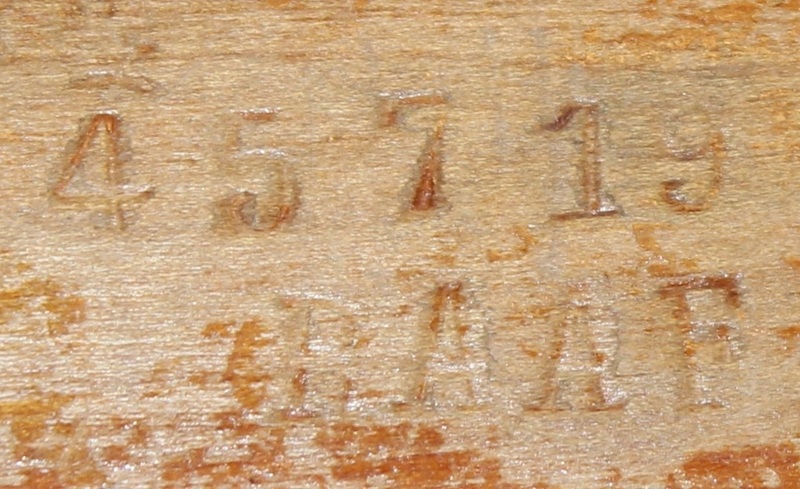 A wooden clothes/shoe brush stamped 45719 RAAF. John Alan Mellows enlisted on 11 Sep 1941 at Perth and discharged on 12 Dec 1945 as a Flight Sergeant from Headquarters Western Area. PI194. Close up of service number.